I am so excited to have Amy Sandas here at Paranormal and Romantic Suspense Reviews with a Spotlight and Giveaway. 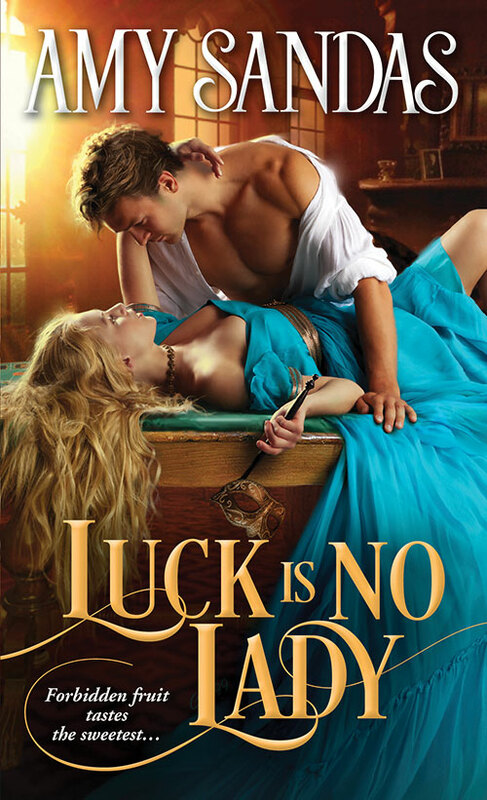 Thanks Amy and Sourcebooks for allowing me to join her Luck Is No Lady Blog Tour! Please take it away, Amy! Gently bred Emma Chadwick always assumed she’d live and die the daughter of a gentleman. But when her father’s death reveals a world of staggering debt and dangerous moneylenders, she must risk her good name and put her talent for mathematics to use, taking a position as bookkeeper at London’s most notorious gambling hell. Surrounded by vice and corruption on all sides, it is imperative no one discovers Emma’s shameful secret or her reputation — and her life — will be ruined. But Roderick Bentley, the hell’s sinfully wealthy owner, awakens a hunger Emma cannot deny. Drawn deep into an underworld of high stakes gambling and reckless overindulgence, she soon discovers that in order to win the love of a ruthless scoundrel, she will have to play the game...and give in to the pleasure of falling from grace. Amy Sandas's love of romance began one summer when she stumbled across one of her mother's Barbara Cartland books. Her affinity for writing began with sappy pre-teen poems and led to a Bachelor's degree with an emphasis on Creative Writing from the University of Minnesota - Twin Cities. She lives with her husband and children near Milwaukee. Why did you decide to write a series involving gaming hell? I’m not sure I actually decided that. It more sort of happened as my characters started revealing who they were and what needed to happen to achieve their happily ever after. This excerpt is from Emma and Roderick’s first meeting, an anonymous encounter behind the fall of a curtain. In return for promising not to discover her identity, he asks her to assist with his disheveled neckcloth. Taking another step closer in order to comfortably reach up to his throat, she began to twist and fold the neckcloth into a style she had recreated many times before. Warmth emanated from the stranger and cool night air drifted around her. There was a solid strength to his body as he stood still and accommodating beneath her hands. The sound of his breath began to match the rhythm of her own and the light-headedness she had experienced earlier returned in a rush. Her fingers fumbled through the familiar movements as what should have been a simple task became weighted with acute expectancy. By the time she smoothed the edges of the cravat beneath his coat, Emma’s breath was tight and her pulse beat in a frantic rhythm. Craving distance and a safe return of her faculties, she shifted her weight to step back, but her retreat was brought to a halt when he lifted his hands to cup her face. “One more thing,” he murmured. Then his mouth covered hers. She had not yet lowered her hands, and they flattened against his chest as she tensed in shock. Her stomach went into a tizzy of uncontrollable flutters, and what remaining sensible thoughts she may have had were sent spiraling from her head. He pressed his fingertips into the hollow at the base of her skull and propped his thumbs beneath her chin, holding her in place to accept the exquisite pressure of his lips. He took a step closer and his feet stirred the fall of her skirts as his body bumped gently against hers. Then he tilted his head and his mouth softened in unspoken entreaty, as if he were asking for something more. Emma had never been kissed before, and as his mouth moved over hers, she found herself utterly unprepared for the sensations it invoked. She never could have anticipated the delicious heaviness invading her limbs or the tingling that rushed through her blood. When he pulled on her lips, as if trying to draw something from her, her body tightened deep inside with a yearning that came on so swiftly it startled her. It finally recalled her to her senses — the inexplicable need that overtook all rational thought. Emma was not accustomed to such a complete destruction of mental acuity, and it frightened her. She tensed the curve of her lower back. The resistance was small, but it was enough, and he lifted his head. Emma fought the urge to run her tongue over her lips. Though he had ended the kiss, he did not step back or release his hands from her face. “You should not have kissed me,” she replied breathlessly as her thoughts began to reorganize themselves and a raw panic seeped into her bones. Her alarm intensified at the thought of him kissing her again. She could not let that happen, not when his first kiss had been so unsettling. A second might be devastating.